In a high energy speech comparing the roles of Division I college coaches and law enforcement leaders, new Golden Gophers head football coach P.J. Fleck talked about the importance of building a lasting, positive culture in an organization. 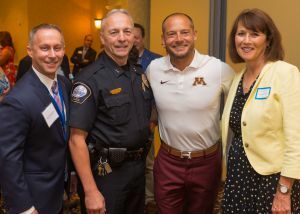 He was the headline speaker at the Minnesota Chiefs of Police Foundation 's breakfast Friday July 21, 2017 which raised money to ensure the MCPA is able to deliver affordable, high-quality professional development opportunities for law enforcement leaders across the state. Coach Fleck made it clear that coaches don't deal with life and death situations, but, like chiefs, they work in a politically charged environment, under intense scrutiny and high community expectations. He explained how his "row the boat" leadership style and coaching mantra maximizes the number of people in your organization (the boat) points it in the right direction (the compass) and moves it forward collectively to the best of everyone's ability (the oar). On behalf of the Minnesota Chiefs of Police Foundation and our Association, a special thanks goes out to the event's Gold and Silver sponsors: the Shakopee Mdewakanton Sioux Community, Thomson Reuters and Standard Water Company. Thank you also to the event's emcee Darrell Thompson, president of Bolder Options, former Gopher running back and long-time color commentator for Gopher football radio broadcasts. Finally, thank you to the Foundation Board members and the private sector companies who attended the event. Their support of our association and the policing profession is more critical today than ever before.